Cooked and then sauteed in a sauce that's vaguely tomatoish and super-extra-hot. But then let me tell you, these are the Kings of chickpeas, inimitably pleasure-giving, humble sailors on a red sea of spices, luxurious, deep, and blissfully stormy. 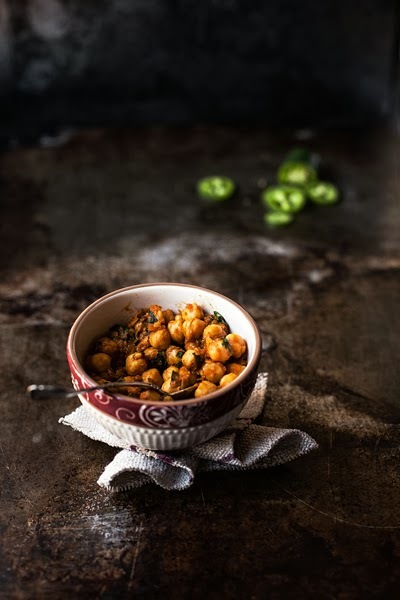 Embellished with a long list of spices, from here to Porbandar, these chickpeas become an alternate reality, a mysterious and welcoming world, a refuge for the heart and the palate. My advice is this: do not be intimidated. Ok, the powders are many and perhaps hard to find, maybe they'll make you run from one side of the city to the other, you'll probably lose patience and maybe even half a day; but perhaps they'll also make you explore hidden corners, discover the magic of new colors bursting with life, or understand the beauty disguised within our conundrums. If you're in doubt, but even not, just do it. Buy them all. Because it's worth it. Because some like it hot. Just do it. And tell them I sent you. Soak chickpeas for about 6-8 hours. Rinse, cover with water and cook over medium heat for about 1 hour and a half or 2 hours, until they are tender. Drain, keeping aside a cup of their cooking water. In a large pot heat 3 tablespoons of olive oil, toast the cumin seeds for a few minutes, then add the ginger garlic paste (if you can't find it, you can use 2 garlic cloves and a lot of ginger, minced; however, if you're lucky enough to have an Indian store, full of spices and traditional products close to home, or even at a 45-minute ride from you, I recommend this alternative), onion and jalapeño, finely chopped, and cook for about 5 minutes. Add the rest of the spices, the reserved chickpea water and the tomato paste, and cook for a few minutes. If necessary, adjust the flavor. Add the chickpeas and cook for 10 minutes; finally add the lemon juice and a handful of chopped fresh cilantro. 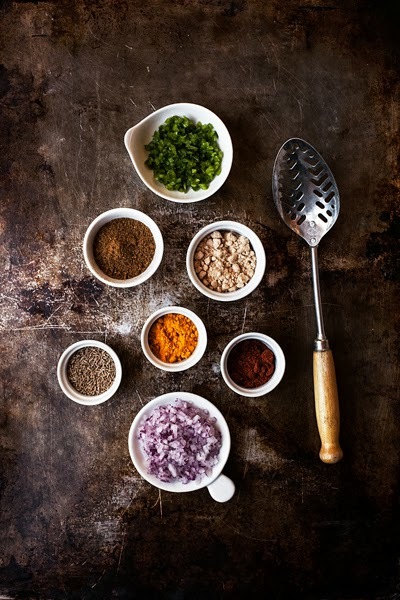 If you wish, serve with basmati rice. Or maybe not. Oops. Shouted bad, hurried toward Cheap Asics Running Shoes the fire attribute spiritual power distribution over the two legs to go, but the fire properties of spiritual power is still very weak, trying to thaw is not a moment can be done. Tantes, ooms, dingen zijn opgelost, ik moet ugg classic short sale gaan, bye. kinder uggs sale goedkoop en keek, het hart is niet echt een gewone mooi, kinder uggs sale Blauw Shengde uggs bailey button sale grinnikte, en vervolgens naar het schoonmaken van de grond, en terwijl het leek goedkoop, weet niet wat te denken. ik weet niet wie de zegen met haar trouwen als zijn vrouw. Vluchtige gedachten, uggs sale nederland zijn ogen flash streamer gezien op het trio zwaaide kinder uggs sale. blanc en état Louboutin Pas Cher de choc. Je compte sur, mon vieux, vous ne Louboutin soldes en ligne voudrez pas de tuer mon corps Louboutin soldes en ligne Le vieil Louboutin soldes en ligne homme grogna, tout l'espace spirituel alors occuper mon corps maintenant. rage pas cher, que le Louboutin soldes en ligne Louboutin soldes en ligne vieil homme toujours en colère. Entre la vie spirituelle de tuer l'autre.